I just love this season of fresh fruit. The ice cream and the sauce both look delicious. Thanks, Marilyn. Peach is probably my favorite fruit, but it's hard to choose just one! And Peach Ice Cream Day is July 17th. My neighbor has some peaches on her tree she is begging me to come pick, so I will have plenty for this. Hi Jean! Wow, would I ever love a bowl of your peach ice cream and then to top it off with blueberry sauce!!! My favorite homemade ice cream is strawberry. I'm thinking your blueberry sauce would be tasty on it, too. Thanks, Kitty! I've posted at least one strawberry ice cream recipe, too, so check it out! Can it be…yes…I think...maybe…oh, almost certainly…this is good…no – grand…yum, yum…so far, so good…puh, fuzzy Styrofoam balls…almost, almost – YES: 5 cleavers! Sully, I am deeply honored to have my recipe awarded the coveted 5 Cleavers Award! Hi Jean! Oh, I do love a perfect peach! Your recipe is lovely! Must go in pursuit of perfect peaches . . . I just love peaches and this looks delicious! :-) Thanks for sharing! Have a wonderful evening. Karen, thank you! I hope you'll give it a try this summer when you find those perfect peaches. Thanks, Jill! Hope you have a wonderful evening as well. Oh Jean, that blueberry sauce sounds like it would be just fabulous on absolutely anything! It's a keeper! Thanks, Jeanie! I like it on waffles and pancakes. Oh my yum ~ Ice cream and blueberry sauce, why yes!!! Thank you for linking up to Thoughts of Home on Thursday. We really appreciate you! Have a wonderful weekend! My favourite is HOMEMADE...anything homemade! So much better than those sugar loaded storebought ones. 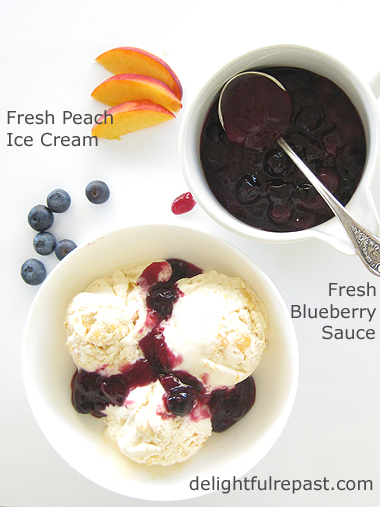 Your peach ice cream looks awesome with that beautiful blueberry sauce. Thank you, Angie! That's what I love about making my own, being able to cut waaaaay back on the sugar. What a great recipe and perfect for summertime and especially wonderful for the 4th of July! Thanks for sharing. Thanks, Bernideen! I'd like to use an old-fashioned wooden crank ice cream freezer, but ... well ... *I* am not going to be the one to crank it! Jean - I love peach ice cream, but only when peaches are in season. 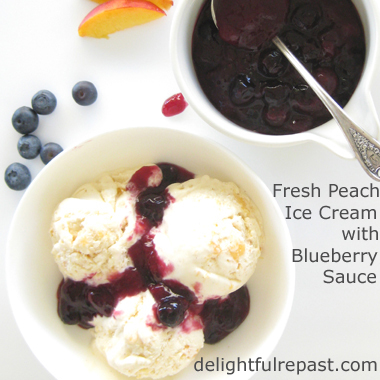 And the blueberry sauce is a great addition, as peaches and blueberries are a great combo. (I once made a peach and blueberry jam - since it was my own recipe and I had never made it, I just assumed a golden jam and little blue polka dots throughout. Ha! It turned totally blue - but very tasty! Thinking of peaches as Southern and blueberries as Northern, I named it the "Jam of Northern Aggression.") It's just about time to go o arch picking here. Ice cream here I come! YUM! I love ice cream! My current favourite flavour is Earl Grey by Foundry Ice Cream (a local ice cream maker). Every August, there is a peach festival in a local community. I keep missing it, but maybe this year, I'll finally make it! Thanks, Deb! I use my freezer to take advantage of that "short window!" Margie, thank you for reminding me! A few years ago I thought of making Earl Grey ice cream, then I never did it. Must get on it! Wishing you a lovely Sunday. Hugs! Stephanie, thank you so much! My husband is not the huge fan of peaches that I am, but even he loves this ice cream and would happily eat it every day! Marilyn, thank you so much! I'm honored! Thank you for hosting and sharing. As an ice cream enthusiast...I am highly intrigued! Thanks, OE! I hope you'll give it a try! Thanks so much, Marilyn! Pins and Yums and any kind of SM shares are greatly appreciated. 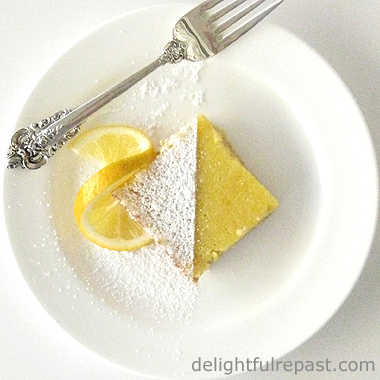 Delicious Jean, I need to try it, thanks for sharing Hearth and soul blog hop, pinning and tweeting. Swathi, thanks so much. You are the best! Be sure to come back Thursday for my Earl Grey Ice Cream. Thank you, Annette! Yes, Delightful Repast is "headquarters" for all sorts of things to do with peaches! Wow. Double Wow. The perfect summer dish. Doing a little visiting this morning before I make my way to the garden and go on my walk. Jean, this is a beautiful dessert and I can only imagine how delicious this combination tastes together. I am pinning this one, right this minute! Clairejustine, I could, too! Except for one thing, it's all gone! I need to pick up more peaches at the farmers market tomorrow. Thanks, Amalia! And this is such an easy ice cream to make. April, thank you so much. Since I'm not on FB (or so many other SM things) myself, I really appreciate your sharing my posts there. Jemma, thank you AND thank you for Pinning. Much appreciated. Hope you're enjoying your walk (that's what *I* need to be doing now, but it's not going to happen today!). Suzie, thank you! I hope you will try it soon and enjoy it as much as we do! I will take a pint to go please! This is my favorite summertime treat! Can't wait to try your recipe. Pinned. Oh gosh I wish I had a bowl of this right now!.. Do you deliver? Pure summertime and thanks for sharing the recipes! Susan, I'd love to deliver a pint of this and pick up a batch of your brownies! Cathy, I'd love to pop in with a batch of this for you and take a tour of your 1929 charmer! Thank you, Karen! It's perfect for summer! Summer, thank you! Peaches (and tomatoes) are my favorite things about summer. I've been wanting to make something with fresh peaches lately! Ice cream would be such a yummy way to enjoy them. Thanks, Jenna! I hope you'll make some soon, it's just soooo summery! This sounds so amazing.You combined to of my favorites in this recipe, peaches and blueberries! I never would have thought I could make homemade ice cream. The recipe you shared makes it easy for me to understand and I love the idea of homemade natural ice cream .Thank you so much. Thank you so much, jennielynn. That's what I aim for -- giving all the details so that even someone who has never made it before can have success with it! Jean, thanks for commenting my post, I do appreciate. This ice cream looks delicious and colored; perfect for summer. What a cute blog you have, I'm following you. Manu, thank you so much! I really appreciate that and wish you a wonderful day too. Oh my goodness, Jean! I love peach anything, and your admonition that the peaches be completely ripe is so important. Blueberry sauce? Yum! As far as making ice cream this summer, after spending 2 months in virtual immobility, I better not even consider it. Later, yes. And my favorites are peach or cherry nut or raspberry. I love the fruit flavors and although i almost never eat Culver's custard, it still always disappoints me to see their marquee (sp?) naming yet another variation of chocolate as flavor of the day. Judy, I'd hoped you'd see this one (knowing your love of peaches). I'm with you on the fruit; chocolate is highly overrated! I hope you'll be active enough soon to work off some ice cream calories! BRnLC, thank you! Be sure to tell him I have lots more flavors listed under Desserts on my Recipes index page.